Seward or Sewards? There's a mention in the Hull Daily Mail of a Seward playing ping-pong at St. Matthew's, in 1902. I also came across a letter, published on 11.4.1900, written by a soldier, who was at Colenso with a Fred Seward - was he the same man as John Frederick Seward(s)? 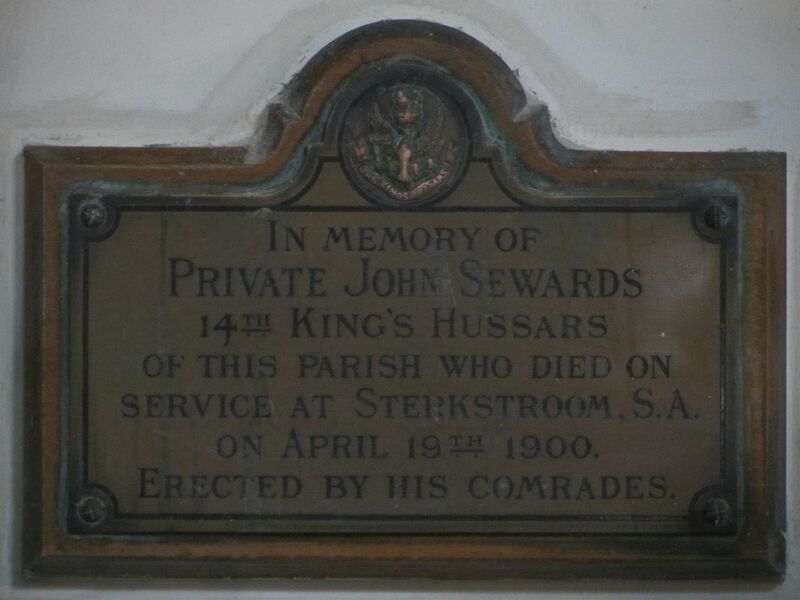 The plaque, which is in St Matthew's Church (now closed), Hull, is small, but it isn't currently possible to compare it in size to neighbouring plaques. You have a choice of photographs - au naturel or illuminatum. My thanks to Jim, at Giroscope, a Hull housing charity, for arranging my visit. Giroscope has taken the building over, and is working to bring it into community use. The stained glass in the west window, which is a memorial to the WW1 Fallen of the church, has been removed, and is currently being repaired and brought back to life, thanks to Giroscope. HULL MAN DIES AT THE FRONT. 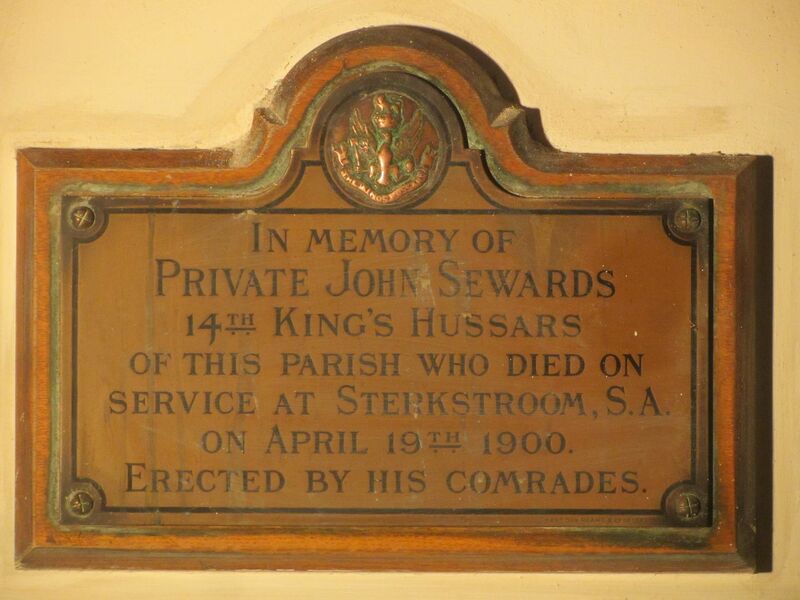 Information has just reached Hull that Private John Frederick Seward, of the 14th Hussars, has died from enteric fever at Sterkstroom. Seward, who was only 21 years of age, is a Hull man, his parents residing on Holderness-road. He enlisted three years ago. I think I would go with illuminatum, it gives the viewer a far better idea of the actual appearance of the memorial in the flesh. BereniceUK wrote: Seward or Sewards? There's a mention in the Hull Daily Mail of a Seward playing ping-pong at St. Matthew's, in 1902. I also came across a letter, published on 11.4.1900, written by a soldier, who was at Colenso with a Fred Seward - was he the same man as John Frederick Seward(s)? I thought to check his birth registration, and he was John Frederick Sewards, born in the second quarter of 1878, and the birth was registered at Sculcoates, in Hull.